ES – Please introduce us to your role in your organisation? Dilpreet – DSO: I’m the founding Partner and Director at Eventually Pro LLP. My Role is to steer the organisation to greater heights with a strategic focus on large format events and exhibitions. My role also is to strengthen our client relationships and deliver delight each time we deliver a project for them. ES – When did you start your journey in the exhibition industry? Dilpreet – DSO: I began my journey over 2 decades back as an architecture graduate and began working with my Father’s company (Arch Concepts Pvt. Ltd, a pioneering name in the events & exhibitions space) with projects ranging from interiors to museums and yes, exhibitions around the world. What my architecture background did is helped me see each project from a professional point of view and enabled me to deliver designs and plans that were a cut above the rest. So yes, its been 2 decades of doing exhibitions since. ES – What all services does you organised offer and Who all are your major clients? Can you highlight some of your key achievements. Dilpreet – Eventually Pro is a full service events and exhibitions company and we pride ourselves as the ally for all things experiential for our clients which range from Industry Bodies/ Chambers (FICCI) to Government Departments and ministries and some leading Corporate names like Dyson, Volvo Eicher Motors, Royal Enfield and the Vedanta Group to name a few. We are proud to have delivered quite a few large format events. This would include – 2 Editions of the International Day of Yoga (for Ministry of Aiyush), Janadhriya Festival Saudi Arabia (For FICCI & MEA), Wings India – Biggest Aviation event in the country (For FICCI), India Launch of Dyson – the British Appliances brand and yes, the most recent one – for FICCI and the Ministry of Environment, Forests and Climate Change – The World Environment Day 2018 where India was the host nation for this UN event. We managed the whole event end-to-end. The event had over 12000 Sq Mt of Curated spaces, 3 days of Conference at Vigyan Bhawan, a special hall for UN Agencies and a 2 day live entertainment piece at Rajpath. We are truly proud to have delivered this one flawlessly. ES – According to you what is significant of the face to face / experiential industry? What are the future trends coming up in this industry ? Dilpreet – The significance of the experiential industry should be evident from the year on year growth that it has delivered over the last decade or two. The Indian Media and Entertainment (M&E) sector reached almost INR1.5 trillion (US$22.7 billion) in 2017 (according to FICCI EY Report 2018 and we as experiential marketeers are certainly part of this growth story. In fact, up to 40% of all media spends are pegged in the face-to-face / experiential part. As far as the trends are concerned, this percentile figure is only going to go up as we go forward. Another key trend is the use of Digital and Technology in the experiential space. From more and more VR interactives to other new tech and social media integrations are among the new trends. ES – How do you utilise the power of technology and unique innovation in your work please give some example? Dilpreet – As I said above, Technology is the next big wave in the experiential industry and anyone not utilising it to their advantage is clearly not going to last in the business. We are proud to have integrated technology in most of our recent projects whether is World Environment Day – where we had a VR booth for saving the oceans or the real time Selfie booth to creating engaging games for Eicher Motors at their launch events, we are proud to be in sync with the times. We also pride ourselves in pushing these technologies to our clinets and sometimes even educating them about the latest trends in content presentation and interactive avenues. Exhibition Showcase talks to actual participants in tradeshows and understands their take on exhibitions. Exhibition Showcase spoke to Mr Boratkar about his professional journey and the CIDCO venue which his company operates. 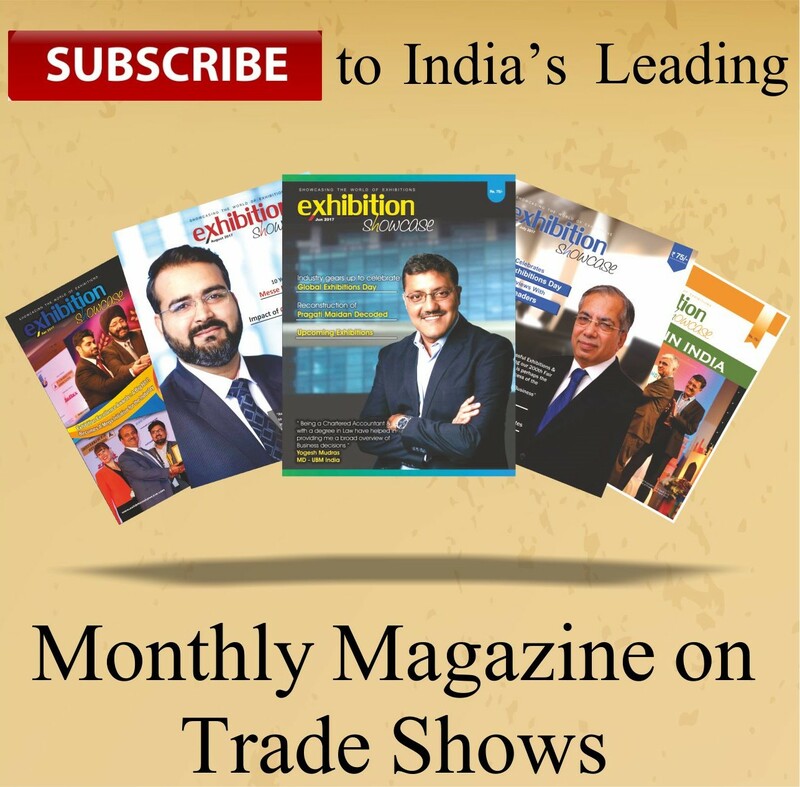 Exhibition Showcase Talks To Thomas Schlitt, Managing Director, Messe Düsseldorf India Pvt. Ltd.